France, 1968, 72 minutes, Colour. Voices of: Roger Carel, Jacques Morel, Micheline Dax. 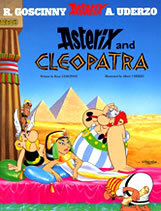 1968’s Asterix and Cleopatra was the second of the animated films, the first being Asterix the Gaul. Animated films of the popular Asterix comics have continued to be made right into the 21st century (with Roger Carel in 2006 still voicing Asterix). The films keep fairly faithfully to the comic strips, with the look of the characters, their mannerisms, behaviour. The dialogue is also witty with its play on words. In this film, Cleopatra calls on the help of Asterix and Obelix to build her a summer house in time to win a bet against Julius Caesar and his architects. Three live-action films of Asterix and Obelix have been made, especially with Gerard Depardieu as Obelix: 1999’s Mission Against Caesar, 2002’s Mission Cleopatra (with Monica Belucci as Cleopatra) and Asterix and the Olympics for 2008. 1.The popularity of the Asterix cartoons? Entertaining, humorous, their view on history, the conquered Gauls, the conquering Romans, the Egyptians? The drawing style and its keeping close to the comic strips? 2.The animation of the strips, the backgrounds, the characters, the action? The wit? The songs? 3.English versions and the dubbing of jokes about Egypt, the play on words and names? 4.Egypt, audience interest? Cleopatra? Caesar and the caricature, his conquering Gaul, his confrontation with Cleopatra and the test? 5.Cleopatra, her shrewish behaviour? Dramatic, her court, the building, wanting the summer house, the pomp? The lion and the crocodiles? 6.The architect and the buildings, the concern, the collapse, the rivalry? The bad deeds? Going to Gaul, relying on Asterix and co? 7.The light touch with the Gauls, Asterix as the hero, nice, Obelix and his weight, eating, enjoying himself? The priest and the potion? 8.The building, the work, the success? The stone and the journey? 9.The dastardly actions of Caesar and his friends? 10.An overall success for Cleopatra? For the Gauls?